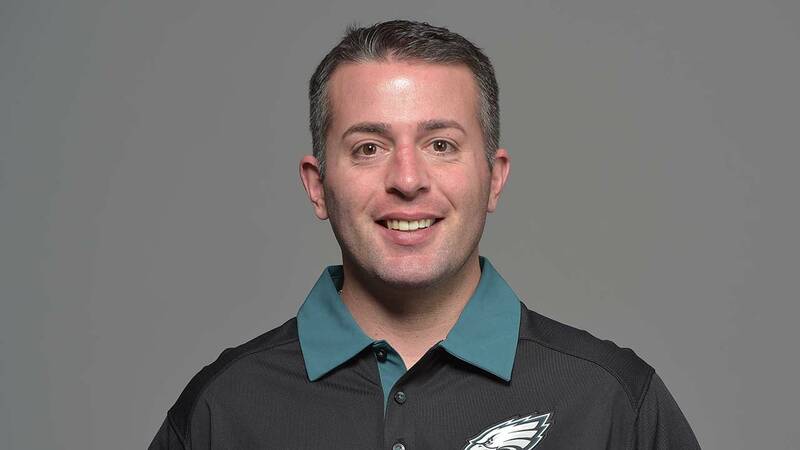 This is a photo of John DeFilippo of the Philadelphia Eagles NFL football team. This image reflects the Philadelphia Eagles active roster as of Tuesday, June 20, 2017. MINNEAPOLIS -- The Vikings have their new offensive coordinator. Hours after the Eagles wrapped up a day of celebration with their Super Bowl victory parade in Philadelphia, quarterbacks coach John DeFilippo was hired by the Vikings to take over OC duties. The Vikings had purpose in waiting until after the Super Bowl to make a hire. Former offensive coordinator Pat Shurmur was introduced for the first time as the New York Giants head coach on Jan. 26, the day Mike Zimmer began conducting interviews for his replacement at his ranch in Northern Kentucky. Shurmur had been officially hired by the Giants the day after the Vikings lost the NFC Championship to the Eagles. Minnesota interviewed four candidates ahead of Super Bowl week, including Vikings quarterbacks coach Kevin Stefanski, former Seahawks offensive coordinator Darrell Bevell, Saints assistant coach/tight ends Dan Campbell and Texans quarterbacks coach Sean Ryan. DeFilippo's contract originally ran through next Wednesday, but the Eagles granted him permission to meet with the Vikings on Thursday. In turn, Minnesota didn't waste any time in securing its new offensive coordinator. For the past two seasons, DeFilippo worked with the quarterbacks in Philadelphia and helped Carson Wentz develop into an MVP candidate before he tore his ACL in Week 14. DeFilippo worked wonders with backup QB Nick Foles, who led the Eagles to their first Super Bowl win last Sunday while earning game MVP honors. "Coach Flip, he's a grinder," Foles said Monday. "Barely sleeps. Fundamentals, giving us the game plan, giving us all our checks, extremely detailed. I'm grateful for him. He's done an amazing job this year. It's not easy when your franchise quarterback goes down. But the great thing about our team and our coaching staff is, they work so well together and they do it all together. ... We're very fortunate as players to have such a great coaching staff." DeFilippo was one of a few candidates for Minnesota's opening with playcalling experience. Back in 2015, he served as Cleveland's offensive coordinator. If the Eagles make another Super Bowl run next season, they might have to do it without another key piece on offense. Philadelphia OC Frank Reich is a candidate for the Colts' head coach opening that became vacant this week after Josh McDaniels decided to remain as offensive coordinator for the New England Patriots. In Minnesota, DeFilippo will have the keys to the Vikings' offense, whereas in Philadelphia, a promotion to OC if Reich were to leave might not yield the same freedom. Eagles head coach Doug Pederson holds playcalling duties on game days. Now that the Vikings have their offensive coordinator in place, the focus will soon shift toward finding their quarterback for 2018. General manager Rick Spielman said last week that the next OC will play a role in determining which quarterback will lead the Vikings next season. "He'll have a major part of the decision-making process," Spielman said. "He'll be heavily involved in that. But the way that we structure everything is that everyone has a part of that process in the decision, and myself, coach Zimmer, our scouting department and all of our coaches. Anytime we're making major decisions, we have a systematic approach that I feel is very thorough to get through so that you can make the best decisions possible and this will be no different, whoever comes in."